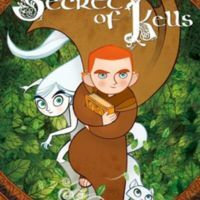 The Secret of Kells (2009), co-directed by Tomm Moore and Nora Twomey, is an astonishing homage to Ireland and Celtic culture. Based on the story Tomm Moore wrote, it premiered on January 30, 2009 at Géardmer Film Festival in France, received worldwide acclaim, and was even nominated for the Academy Award for Best Animated Film. As its name suggests, the movie centers on the story of the most celebrated national treasure of Ireland, The Book of Kells, and its creation in around the first decade of the ninth century, theage of Vikings. The film is about Brendan (v. Evan McGuire), a 12-year-old boy who lives in a monastery with his uncle Cellach (v. Brendan Gleeson), the abbot of Kells. It is a time of instability and insecurity, so abbot Cellach decides to use all the resources he has to build a giant wall to protect his people from the Vikings. Brendan, however, is distracted by the unexpected arrival of brother Aiden (v. Mick Lally), a famous illuminator who escaped the Viking attack and came to Kells as a refugee. 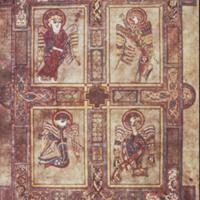 Aiden brings with him the book of Iona, an unfinished illuminated manuscript of the Gospels. Aiden sees Brendan’s great potential in manuscript illumination and begins to train him so that one day Brendan may finish the work he and his brothers started in Iona. 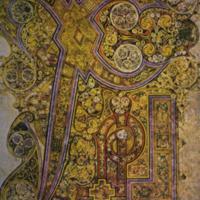 Through the lens of the creation of The Books of Kells, the movie explores the adaptation of Celtic culture into insular Christianity, the artistic representations of which, The Book of Kells, reflects the cultural and ethnic interaction in both medieval Ireland and the contemporary world. The old Celtic pagan religion, and its clash with Christianity, is perhaps the most important theme explored in the movie, although it does so in a subtle way. This “confrontation” is mainly peaceful as shown in the film. Aisling, a figure of Irish mythology, is as much of an important figure as Brandan. Her friendship with Brendan suggests that, despite the seemingly conflicting ideas in Christianity and paganism, “Christian virtue and a love of nature, so often associated with paganism, are not mutually exclusive” (Overstreet). The forest she lives is the materialization of Celtic culture and she the personification, both of which are dying because of the spread of Christianity. She is cautious and even hostile when Brendan first stumbles across her domain, but when she realizes Brendan and his art could preserve her heritage, she begins to help him and his marvelous project. In the movie, as Brendan is painting, he is drawing inspiration from trees, animals, nature, and there is a playfulness in his design; in the history of art, illuminated manuscripts like The Book of Kells and The Lindisfarne Gospels (and their vivid images and twisted letters) are the invisible words spoken about pagan culture in the British Isles, and “help make the strange written text that is so central to the Christian more familiar to the only recently Christianized people” (Diebold, 24). Yet this acculturation also has a price:even Aisling realizes that her time and her way of life are gone. She hides beneath the disguise of a white wolf as the adult Brendan travels across her forest many years later, knowing that the old time can never come back to her and young Brendan anymore. Just as how Celtic paganism and Christianity are intertwined in art, so are they too, as the movie suggests, tangled in real history; yet, rather emphasizing how different each culture is, the filmmakers instead chose to create a sense of how universal the appreciation of beauty and art is for all cultures and races. In the film’s remote monastery of ninth-century Ireland, Asian and African monks are present, and they all are living and working peacefully together. This reflects how monks from outside cultures came to Ireland. Most famously, when St. Augustine of Canterbury arrived in England in 597 A.D., he brought with him a completely different Mediterranean style of worship and art. In the next three centuries, the “issue of Anglo-Saxon versus Celtic influence has been the subject of much debate” (Howie). These two started to compete with one other, but they eventually merged, and by the ninth century, insular and the Mediterranean styles became “reconciled” in The Book of Kells, which is one of the finest examples that share both the insular and Mediterranean artistic qualities. Abbot Cellach, Brendan’s uncle, builds a giant wall to protect his people from the outside world. In the movie, he constantly denies Brendan’s enthusiasm and forbids him from going out to the forest. Yet it is from the forest that Brendan is able to finish illuminating the book, and this kind of book has the immense power that allows, as Aisling says, “beauty thrive in the most fragile of places” and “turn darkness to light.” The film seems to lament the inevitable twilight of Celtic pagan culture, as Christianity slowly takes over and roots out its influence, but it also shows how Celtic culture survives and flourishes in Christianity. The Bible from another world, and the Celtic elements of this world, they are, perhaps, after all, the real secret of The Book of Kells. Diebold, William. “Books for the Illiterate? 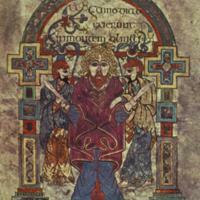 Art in an Oral Culture,” in Word and Image: An Introduction to Early Medieval Art (Boulder, CO: Westview, 2000), 9-44. Howie, Elizabeth. “Early Insular Illuminated Manuscripts: Merging of Oral and Literate Culture.” Essay, accessed March 21, 2018. Overstreet, Jeffrey. 2010 “An Extravagant Tribute to Beauty: The Secret of Kells is a Visual Wonder and a Glorious story.” Christianity Today 66, 2010. General OneFile, EBSCOhost (accessed March 21, 2018).